ing arrive at the conclusion that it was absolutely nonexistent for so long—they kept so completely in subjection that people became accustomed to its absence, and were tempted to regard it in the light of a negligible quantity. This condition of affairs prevailed from the time of Napoleon the First until about the year 1890, or even somewhat later. Then, at last, indications appeared again, slight, it is true, but none the less definite and unmistakable, that a new spirit, or the old one revived and appearing in a new guise, was at work. Strange and novel creations, bearing no relationship whatever to, and, indeed, differing entirely from, those with which the French had become so accustomed by long usage—in fact until they seemed almost to have become part and parcel of their very existence !—commenced to appear in odd corners of the furnishing showrooms of Paris. As a certain demand for them seemed to have been created, they found their way, by degrees, though somewhat timidly at first, into the shop windows. As a natural result, people commenced to wonder what they were, and whence they came, and to talk about them. They certainly appealed to the taste for novelty inherent in human nature. Then came the 44 craze." his fingers' ends, and would unquestionably have been able to make a comfortable living had he continued in the time-honoured paths of his forefathers- That, however, was just the thing that none of them was content to do. It was their opinion that they had all done this for far too long a period ; so they finally and irrevocably decided that a strenuous effort must be made to strike of? the shackles of time-worn traditions, and break boldly away from long-accepted custom ; apparently agreeing with Carlyle in his pronouncement that " custom doth make dotards of us all." 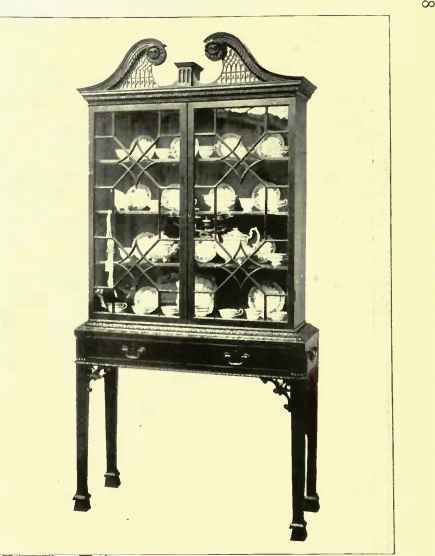 284 style in furniture little or no ingenuity was demanded ; all had simply to be brought together in such a manner as to constitute one harmonious whole, resembling specific old and familiar models as closely as possible. Those models, it must be noted, were so well known throughout the land, even by the "common people/' that any radical deviation from their lines or details was certain to be detected, as I have indicated, and the chances were that, should any such be discovered, it would meet with but scant favour. Having, then, determined to abolish this state of things in so far as its existence affected their own work, the designers whose productions we shall presently consider positively refused to be bound any longer by hard-and-fast convention, or be trammelled by custom. Desiring to be allowed an absolutely free hand, to the end that whatever creative faculties they possessed might have full play, uninfluenced by antiquated custom or tradition, they harked back from the well-worn paths they had traversed from their youth up, and returned straight to Nature, in order that they might obtain their ideas fresh, and unsullied by passage through the brains of others—direct from the only true source of all Beauty. Verily, a more desirable course could not be adopted by anybody, nor one calculated to lead to better results, provided always—and here comes the crux of the whole matter—• that Nature be approached in the proper spirit, and that the lessons she has to teach be correctly learned and not misconstrued. Pitfalls, however, are to be found almost everywhere; even in situations where their presence might be least suspected. That there were many, and dangerous ones, in the road which this little band elected to follow, is made painfully evident by many of the productions which they have given to the world in the course of little over a decade, and by which the success of their undertaking must be estimated.